Chocolate Gifts-Molded Delights 8 oz. Customize your logo on 8 oz. Molded Chocolate Delights for promotional chocolate gifts. Applications include economical holiday or everyday marketing for satisfied customers. embossed with your logo and a choice of two stock themed designs to frame it. Wrap up the entire gift with choice of a Gold or Silver box w/ cord ribbon. 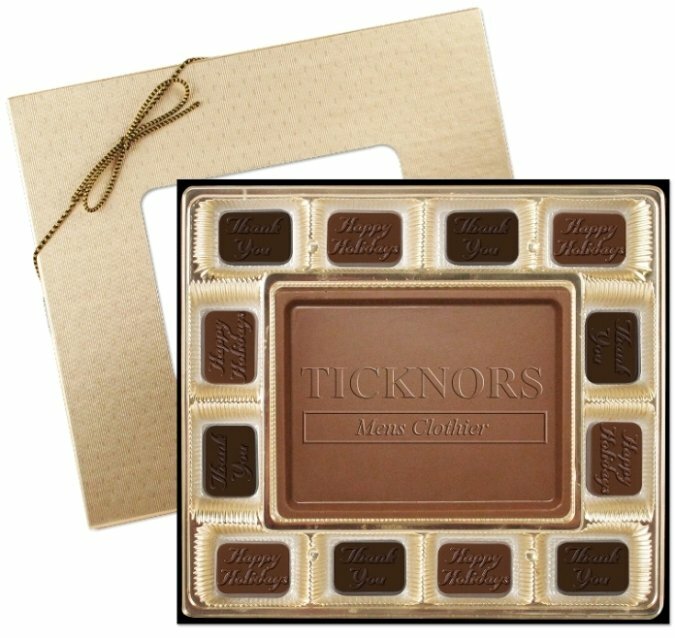 Overall size of the delights 8 oz chocolate box is 7 3/4 wide x 7 high. Price includes a embossing top of chocolate bar area 3 7/8" w x 2 7/8" h.
Factory mold charge is $99.00. Molds kept for up to 1 1/2 years. Logo requires Illustrator ai, eps or pdf black on white art file. Black portions of the art will be raised on the center bar.